“Star Wars was always a boys’ thing and a movie that dads could take their sons to, and though that’s still very much the case, I was really hoping this could be a movie that mothers could take their daughters to, as well,” said JJ Abrams, director of the newest film in the Star Wars series, The Force Awakens. It’s a big shift in thinking for the franchise whose fandom had been perceived especially by merchandisers as predominantly male. Yet Abrams seems to be confusing two different issues – that Star Wars has traditionally been a fairly white, male homogeneous film on the screen versus the incredibly diverse fanbase that the films have enjoyed offscreen. I speak from my own experience as a lifelong Star Wars fan: I first saw Return of the Jedi with my younger sister when I was nine years old. Sure, we both loved the cute, cuddly Ewoks and we were probably at the right age to accept the idea of the Force without questioning the myriad of inconsistencies, but even then we understood there was something magical about Star Wars, and especially Princess Leia (Carrie Fisher). We spent hours discussing what we would do as senators during the takeover of the Galactic Senate. At the time I was just becoming interested in politics and beginning to understand that the government I saw in my reality was overwhelmingly white and male. Leia was a member of the Galactic Senate, organising humanitarian missions, arguing loudly for democracy and human rights, but when in a life-threatening fire fight, she was also the films’ best shot with a blaster. When we first meet her in A New Hope, she is compassionate but defiant. “You weren’t on any mercy mission this time,” Darth Vader (James Earl Jones) spits at her, bringing to my mind untold but imagined humanitarian crises and missions that Princess Leia had undertaken. She was a role model I had been looking for: unafraid to stand up for what she believed in and never short of the eloquent words needed to make her argument. Yes, she might have fallen in love with a handsome smuggler along the way (Harrison Ford’s iconic Han Solo), but her priority was always protecting the Rebel Alliance, achieving her mission to overthrow the Empire. The idea that a relationship could start not with love as first sight (like in Disney movies), but through banter and teamwork of two equal partners working together to save the galaxy sounded a lot more interesting and rewarding to me. I didn’t want to be a woman whose story seemed to end when she fell in love. I wanted to establish a relationship based on shared goals and principles. To this day, when asked about my childhood role models, I would cite Princess Leia and clearly her massive fan following amongst both young girls and boys indicates she enchanted plenty of others. I was lucky I could identify so strongly with Leia, because female characters in the original trilogy were sparse and sidelined during action sequences. There is a stereotype that Star Wars is a movie for boys – to the point of selling action figurine sets without Rey and female villain Captain Phasma (Gwendoline Christie). It’s disappointing and hardly representative of the experiences I’ve had in Star Wars fandom among many women. The new movie promised to be more diverse and it does indeed deliver, in casting crowd scenes and minor roles. No longer is everyone on the Rebel base nor all of the fighter pilots white men – I was incredibly excited to see both an Asian woman and a man of Indian descent flying for the Rebellion during a critical fight scene. Even the evil First Order has diversified: the descendant tyrannical organisation of the Empire seems to have used the time between Return of the Jedi (1983) and The Force Awakens to lean in, as women now make up a significant part of their ranks. It’s a bit concerning when an organisation happy to destroy entire planets is more gender-aware than the leadership of most Fortune 500 companies. The main characters of this The Force Awakens continue this trend of exciting casting: we’re introduced to former stormtrooper Finn (Black Briton John Boyega), scavenger Rey (Daisy Ridley) and ace pilot Poe (Hispanic actor Oscar Isaacs). It amplifies a sense that the First Order’s General Hux (Domhnall Gleeson) and Kylo Ren (Adam Driver) are relics from another time, reminiscent of Donald Trump or Nigel Farage, clinging to a long gone historic supremacy. Watching the new film, I was envious of every young girl being introduced to this Star Wars, a world where women can be heroes, villains, fighter pilots. Finally Star Wars is becoming a franchise that better matches its broad fanbase – and more diverse casting in the next films (and Rey action figures!) would continue that trend. Nick Beard is a massive fan of both Star Wars and Star Trek and does not find the two to be the least bit contradictory. In between debates about the Ferengi’s view of capitalism, she can be found doing a PhD in London. Tweet her @beardy911. Picture is a still from Star Wars: The Force Awakens. 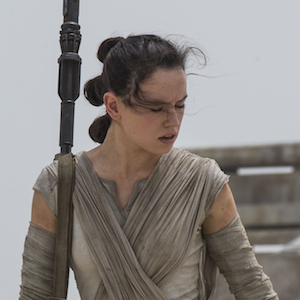 It shows a robot BB-8 (it’s white orange and grey) in the background and Rey (Daisy Ridley) in the foreground. She’s a young woman with green eyes and her hair tucked back, she’s looking into the camera concerned/frightened and her mouth is open as if she was shouting something or perhaps making a disgusted sound. Photo: Film Frame © 2014 Lucasfilm Ltd. & TM. All Right Reserved. © 2015 Lucasfilm Ltd. & TM. All Right Reserved.